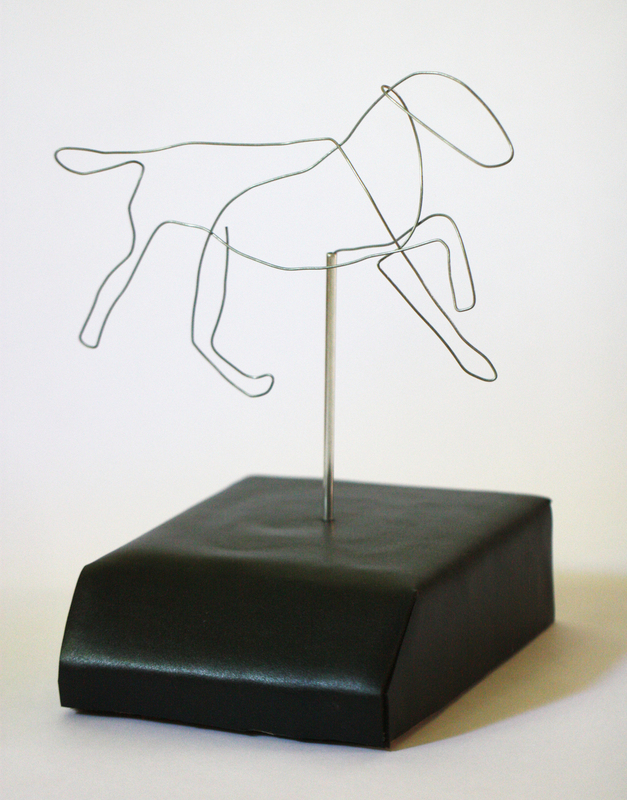 Create an award for the 2012 Palo Alto International Film Festival (PAIFF). My colleagues at the Palo Alto Institute didn't have much of a budget for the award at their annual film festival, but they did have high aspirations for an iconic piece that felt impressive enough to satisfy the international set of artists receiving the award. I worked with Travis Kirton, a colleague whom I met at the Ars Electronica Center in Austria, to put together a few prototypes to share with PAIFF. In the spirit of low-resolution prototyping, we tried to get across the spirit of the award without spending too much time perfecting the details. 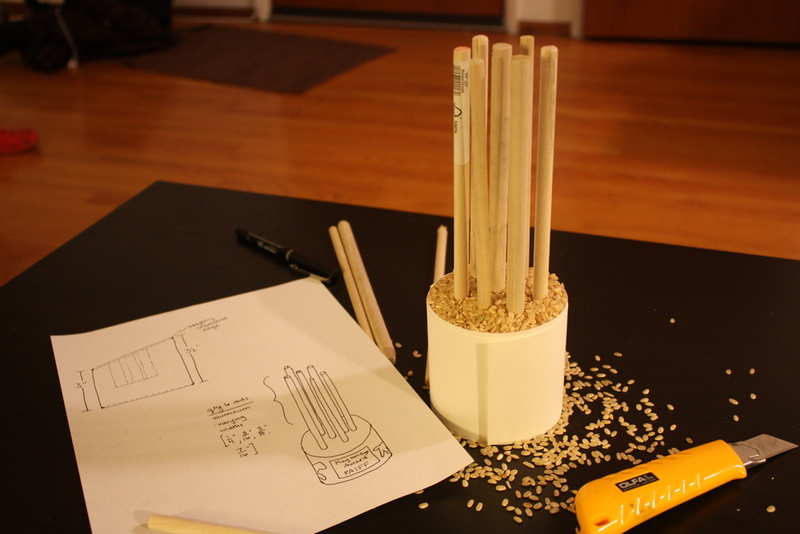 After a brief meeting with the PAIFF team, the rice, paper and dowel prototype emerged as the winner. The design is an abstract representation of the El Palo Alto, and was Travis' contribution to the mix. The designer in me liked its iconic nature, and the mechanical engineer in me liked how simple it would be to manufacture... or would be if I actually had access to any sort of CNC mills. Now that the design was decided, there was just the small problem of figuring out how to have 12 awards manufactured with essentially no budget and only a month of time. 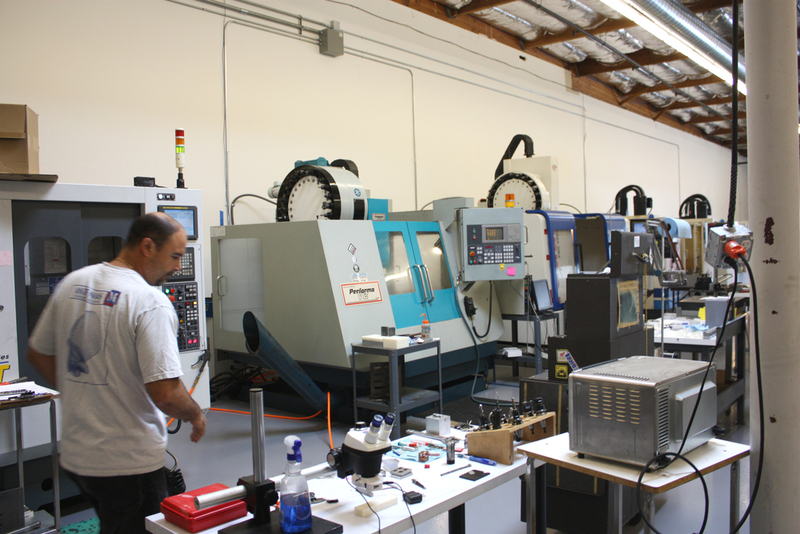 Trying not to panic, I contacted the Menlo Park Tech Shop and learned that they're really only good if you have a few months and the few hundred dollars necessary to train on all of the various machines needed to manufacture the parts yourself. Nix that option. After calling a few shops and hitting more dead ends, I stopped by IDEO to get the advice of the shop manager, Nacho Mendez (best name ever, right?) Nacho came through for me and told me to contact the ex-IDEO team at Proto-Quick. This advice earned Nacho a six-pack of beer, cookies and profuse thanks after the project was successfully completed. I called the Proto-Quick team to describe the project and our nonexistent budget. They were excited about the award, so Art Director Kaitlin Sullivan quickly put together a sponsorship package as compensation for their contributions to the festival. Proto-Quick proved to be a great partner for us. The Proto-Quick guys liked our prototype and graciously offered to fit our project in among all of the other work they were doing. The quick sketch I sent to the Proto-Quick team before our visit. It included the materials and finishes I wanted, and the rough dimensions that Kaitlin and I liked. We got a quick tour of their shop, which included CNC mills, wire EDM machines and a space for a soon-to-come injection molding machine. I knew our awards were in good hands. We went back and forth with the Proto-Quick guys on CAD mockups, and were impressed by how talented and responsive they were. A couple of weeks before the festival we met to see the first prototype. It was incredibly exciting to finally get to hold the real award. Even more impressive than the award itself was the fact that the Proto-Quick team was willing to meet with us on a Sunday. What dedicated guys! While Proto-Quick was busy finishing the raw awards, Kaitlin and I spec'd out the colors at Arnold's Metal Finishing (Black bead blast for the rods and polished Bordeaux Red for the base) and called around to every laser etching place in the area until we found one that could handle our parts. It was a bit nerve-wracking at times, and there were definitely moments when we thought we'd have to resort to stickers or some other compromise, but in the end we were able to get the awards done just the way we wanted. Kaitlin finalized the vector artwork and sent the files off to Laser Impressions for the finishing work. She also worked with the various vendors to make sure all of the pieces were picked up and delivered at the appropriate times, and the awards were finalized and delivered by the first day of the festival - phew! I finally got to see the awards on-stage at the awards ceremony on the final night of the festival. It was incredibly gratifying to see them all lined and ready for their new homes! Full credit goes to Max Morse/Getty Images for all award ceremony images. The award winners, including John Gaeta, pictured here with his son, seemed pleased with their hardware, although I did wonder how they were all going to get them through airport security on the way home. Here's a sampling of the award winners. Judging by the way they're holding them, I think we achieved our goal creating an award with heft. And a close-up of the actual award.